The Roland SP-404 has taken an extraordinary leap forward with the introduction of the latest SP-404SX. Apart from the previous exciting, quick and hand on features, it has been reinvented with some other specifications making it more competitive with todays samplers. Updates include the 16-bit linear sampling, FX switching is now smoother and the enhanced DSP effects and a modern pattern sequencer. With the addition of an SD card slot, compatibility the management of data has been made even easier. Roland has been busy this year with their new releases, including the Roland Aira Series and the Boutique Series, but still somehow manages to keep the classics not only updated, but improved. Our Roland SP-404SX Review continues as we plug in the new and improved beauty for another live session. This creatively designed device is perfect for musicians, Dj’s and any other person who is looking forward to creating some amazing sounds. The ease of use of this machine may catch you off guard and have you feeling like a professional producer in no time. It’s no wonder why the Roland SP-404 has been in the arsenal of pretty much every big producer in the game for the last decade. In just a few clicks we already had our idea recorded, mixed, and ready for mastering. 20 minutes in and we’ve created a beat without even trying. Features on the Roland SP-404. Equipped with several onboard effects and has a built-in mic. Sound quality is excellent, nothing lost through the machine. The content is clear and crisp. Roland is here once again to complete your style and help you in making the best appearance and sound. You must have noticed by now that Roland has been providing their clients in the music industry with more than just the huge quality advantages of their products but also at competitive pricing. This will be one of your best companions on the stage, studio, or even in the bedroom bored. Even the live sound engineers we have talked to have some fun with the quick ability to create beautiful sounds at a few clicks..Make sure to invest in SP-404 if you are looking for something technological, affordable and fun. 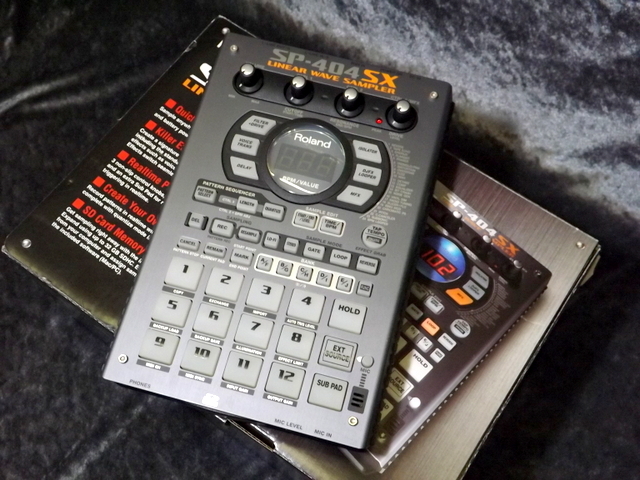 If you are looking for a sampler in the lower price range with massive capabilities, then do not waste another minute of your time..spend that Christmas money and order the Roland SP-404SX. We hope you enjoyed our Roland SP-404SX Review , be sure to follow us on social media and send your friends this way.